The "yellow vest" marches began calmly amid a heavy police deployment of some 80,000 officers nationwide, with protesters singing the "Marseillaise" national anthem and holding signs including "Insecurity is not a job". "We've come to Paris to make ourselves heard, and we wanted to see for ourselves at least once what's going on here," said Patrick, 37, who told AFP he had travelled from the Savoie region. Signs said "Macron resign!" and "France is angry," while police said 18 people had been detained. 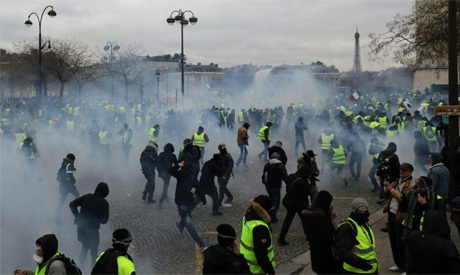 "Those who are calling to demonstrate tomorrow know there will be violence, and therefore they are in part responsible," Interior Minister Christophe Castaner said in a Facebook interview Friday with Brut, a digital news site favoured by many yellow vests. And Macron may not have done himself any favours on Friday, when he told a gathering at the Elysee Palace that "too many of our citizens think they can get something without making the necessary effort."